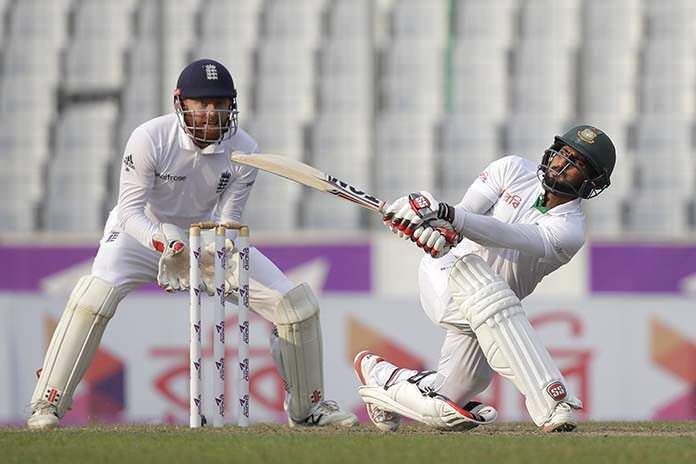 Dhaka, Bangladesh (AP) — Opener Imrul Kayes hit 59 not out as Bangladesh reached 152-3 Saturday, gaining a useful 128-run lead against England at stumps on the second day of the second test. Fellow opener Tamim Iqbal struck a fluent 40 before England made inroads with two quick wickets, leaving Bangladesh on 66-2. Kayes and Mahmudullah combined for 86 runs and appeared to take firm control. But Mahmudullah played a reckless shot against the last ball of the day to be dismissed for 47. Zafar Ansari took 2-33 on his England test debut. Earlier, Chris Woakes and Adil Rashid combined for 99 runs as England were all out for 244 in their first innings, taking a 24-run lead after Bangladesh’s 220. Mehedi Hasan claimed 6-82 for Bangladesh, his second six-for in as many tests. “Hopefully our batsmen put a good total on the board and then we spinners are able to do the rest,” Mehedi said.